It’s not rocket science but it is a craft! I’ve been finding myself staring into space a lot recently. It’s so awesomely huge that it makes my head hurt to think about it too much but thankfully I have beer so it’s never too stressful. It’s been hard not to think about space, what with real-life Major Tom Chris Hadfield hitting the news with his performance of Space Oddity actually filmed on board the International Space Station! Then the amazing opportunity came up on Kickstarter to back the first publicly accessible space telescope, Arkyd and have a ‘selfie‘ sent up and photographed. In space! Then another opportunity on Kickstarter to support the fantastic band Ananamaguchi in their quest to make even more mind-bendingly colorful beepy awesomeness. What do they have to do with space? See their latest video Endless Fantasy and prepare to be impressed. 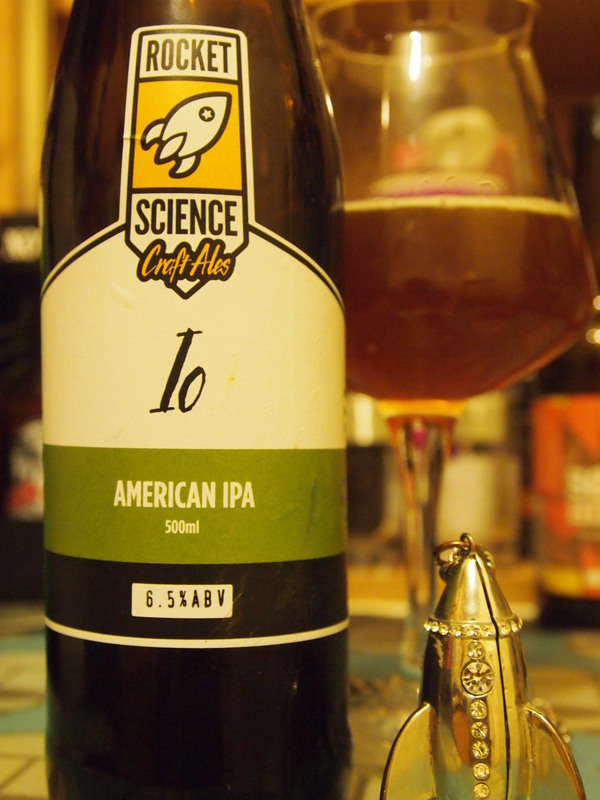 I was very excited when brand new Bristol brewery Rocket Science Craft Ales got in touch to see if I wanted to try some of their new beers. Well since they have such a cute logo how could I refuse. After a long day in London seeing the V&A’s exhibition celebrating the original Space Oddity, David Bowie, it was fitting to open a nicely chilled bottle of the IO (6.5%ABV) to unwind. Named after one of the moons of Jupiter studded with over 400 active volcanoes, this American IPA has a lot to live up to. It’s unfined, unfiltered and unpasturised so it’s about as back-to-basics as brewing gets. In the glass, it’s cloudy dark amber – not what I was expecting – and the aromas are fresh, sharp citrus and slightly sweet honey with a touch of pine. It’s a surprisingly really accomplished American-style pale for such a young brewery – the bitter lemons and grapefruit really hit the taste buds hard making the mouth water and the dryness at the back is so crisp, The acidic pineapple brings a touch of tropical sunshine and there’s a little sweetness in the aftertaste like sherbet lemons. 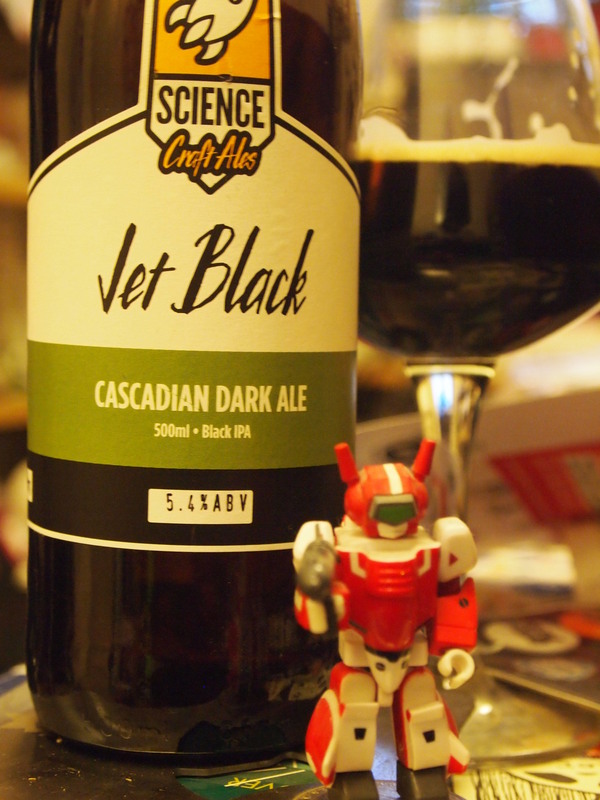 I was most excited about the Jet Black (5.4%ABV) since it’s a Cascadian Dark Ale which is one of my current favorite styles. I’m fairly particular about Cascadian Darks and very few fit the bill for me. This was a very promising pour, jet black like it says on the bottle with a lovely lasting whispy head and an aroma like a charred hedgerow. The dark malts give a burnt crust characteristic to the fabulously bitter hop but it’s lifted by a delicious fruitiness, like a playful cocktail of lychee and cranberries. This is perfectly balances with deliciously bitter dark chocolate – think of your favourite bar of 80-85% cocoa solids studded with crystals of burnt brown sugar. The finish is wonderfully dry with a bitter-sweetness that’s so moreish. I think I’ll be strapping on my jetpack and blasting off to Bristol very soon – I gotta get stocked up on these! Impressive for such a new brewery! Anyone got a spare rib?